I made it to another Christmas. Good news indeed, but ungrateful wench that I am, I'm not quite feeling the joy and love I did last year. 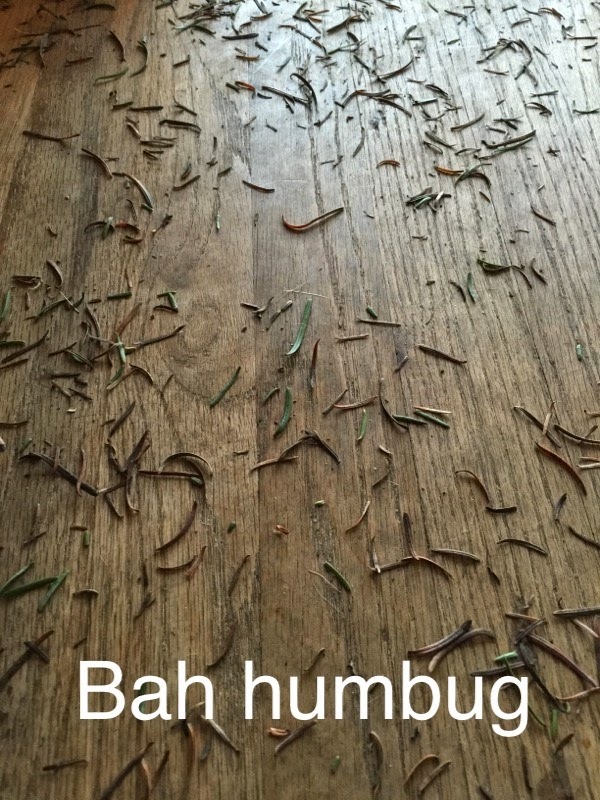 This year I'm back to my traditional, "I hate those effing tree needles all over my floor" rat race. I no longer have the nagging feeling that it's my "last Christmas ever" that is so scary yet also heightens all things good and makes life seem poignant, as if you found a proper Instagram filter or are inside a Hallmark movie. I guess it's good to know that you can go right back to your jaded, cynical, irritable self after living with advanced cancer for a while but still, a sprinkling of seasonal peace wouldn't hurt. Maybe I should dip into the egg nog. I do most of my shopping on Amazon (and for your own shopping pleasure, please use my affiliate link to help me continue) but a few things I wanted to buy I could only get at a "real" store. I also took my home-from-college son to buy gifts for his father and brother, lest they end up with Caltech tee shirts from the book store. Shopping, whether online or in store, is crazy for me these days. I clearly have a gift-giving disorder, exacerbated by chemo-brain. Any mental connection from credit card to actual income is, for me, as severed as a zombie head on the Walking Dead. ...back. My whole life is like that. One pit-stop after the other. I long ago figured out a way to live with ADD, and the big trick is to make sure those around you don't expect too much. It wouldn't be a normal day for my husband if I wanted to go somewhere and didn't ask him if he knew where my car keys were. Wherever I put them down, it has to do with whatever I was thinking about at the time, which could be anything from watering plants to taking a nap. And yes, he has bought me those beeper things that you put on your keys, and they really do work, until you lose the button pushing part of it, or it needs batteries changed and you have no idea where you put those for "safe keeping." Chemo Brain brings on a different set of problems. Unfortunately, after 7 chemos and all the antibiodies, painkillers, and whatever else, I am experiencing some new kinds of cognitive dysfunction. It definitely seems to be getting worse over time, and lately anything I want to remember just flits out of my brain seconds after it arrives, like a dragonfly on a pond. Zip, zap, gone. I cannot remember numbers, dates, what day it is, anybody's name including my own children. I can't remember a single thing I wanted to remember almost immediately after I wanted to remember it, from something as important as making airline tickets to as minor as needing something at the store. The second I think of it and get up to write it down - gone. "Why am I standing here?" It is very frustrating and happens all day, it's the norm for me now. I keep thinking I should put a pen and mini-note pad around my neck and wear it that way, like Super Dork, but like my keys, I'm sure my special necklace would somehow end up in the fridge. For that reason, I'd really hoped to get the Amazon Echo, and so put my name on the list to get one on the first day. I thought if I could just say out loud what I wanted to remember without having to interface with anything, it might help. Unfortunately, I'm not one of the lucky ones who have been selected to give it a test and so my thoughts continually vaporize. Whether I could say anything out loud before I forget it is a question I may never discover the answer to. That's not all that chemo brain has done to me. I have some problems with word retrieval that annoys my family tremendously, and me too. They all finish my sentences now because I can't think of the words. I know my IQ has dropped about 10 points. "Uh, um, uh" is now on the list of my most frequently used words as my mind desperately scrambles to come up with the word. "Tweet" is a word I couldn't come up with today, and instead, my labyrinthine method of communicating somebody's interesting tweets was to say, "You should read Neil DeGrasse Tyson's....um, uh, you know that popular thing, um, you know, the software, um, his twitters...." As a person with a few twitter followers myself, I'm certainly aware of the lingo but my unfortunate sentence was said to a 17 year old so you can understand the reaction. (A snort of laughter, a "you mean tweet?" and an eye-roller capper about describes it.) They haven't quite figured out I actually, literally have brain damage. Of course, to a 17 year old, being in my mid-50s means automatic brain damage anyway. The good news is I no longer blurt out the right answers if anybody is watching Jeopardy. That kind of fact retrieval is now impossible. Oddly, my brain still seems to function smoothly if I am typing. I can get thoughts on paper with coherence. But they won't leave my brain through my mouth without stumbling quite a bit. This makes me quite nervous about SXSW, and I'm wondering if I can type my thoughts onto a screen instead of having to actually, you know...speak. What does this have to do with Christmas? "She's going off on a tangent again," you are thinking now that you know me. Christmas was difficult this year with these new brain farts, because although I have always been disorganized and had minor chemo-brain I was not seriously forgetful. I was actually quite good at my job, which required some higher level multi-tasking skills. This year though, it is terrible, much worse, than before. I have no memory of what I bought for anybody. My curse is going to turn out to be somebody's blessing, for I kept thinking, "I haven't bought my son's fiance anything yet" when in truth, I had, I had just forgotten. I thought that more than 13 times. She now has more gifts under the tree than anybody else. Some of them, she'll even like. A few things I don't even remember buying and was surprised myself when the boxes arrived. One gift came for somebody, and I have absolutely no idea who I bought it for or what I was thinking and did I really choose that color? I wrapped that gift and put a name on it but it is in a size nobody in my family wears. Our family tradition is to open a present on Christmas Eve. The gift has always been PJs and books, started when the kids were young to get them into bed and calm them while waiting for Santa. And, by the kids I mean me, my sister and brother - the tradition started with my mother, and I continued it. We still do it although for many years it has expanded to include a gathering with my stepchildren and their families. I spent five hours wrapping my mountains and mountains and mountains of gifts. I turned on Radiolab, got the paper, the pen, the stickers, the scissors and the tape and dug in. My back still hurts today. But I forgot to keep track (although I had meant to) and by the end, by the time I put them under the tree, I could not remember what was in those packages. Including those Christmas Eve gifts, which are buried ... somewhere. Somebody is going to get a book and PJs on Christmas morning, I suppose. I did manage to send gifts to those who could not be here. I think. Unfortunately, my stepdaughter has a birthday a few days after Christmas, and I now cannot remember what I got her. I believe she was caught up in the first whirlwind of Sephora shopping when the Christmas spirit was high, but who knows? All I can hope for is that I don't buy the same thing twice. The good news is I am comfortable enough to make a decision about next year's Christmas. My kids are adults now and can handle the change in tradition: This year, I'll take advantage of after Christmas sales, and I'm going to get a fake tree, one that doesn't drop needles. The ability to plan. That is my amazing, incredible gift. Worth all the other stuff that comes with it. My very best to you and yours. Have a happy, healthy Christmas (or whatever holiday you celebrate), and a safe and joyous New Year. You can ignore the chapter "How the Brain is Hurt," because it does not apply, but all the rest does. Speech therapy (!) is also a help. A mild stimulant makes a big difference (even if the one I ended up with was for an entirely different purpose). I don't know if it's part of your issue, but ask if removing benzyl alcohol from the equation is possible. It battered my brain badly, but I'm not sure it affects everyone the way it did me. And if there's a neurocognitive program in your area, look into it. Getting an eval was the smartest thing I ever did. Believe me, Ann, I know. I've flooded the house three times (cleaning the turtle tank), and that's just the tip of the iceberg. It fills me with white hot rage that most oncologists want to ignore the issue, but neuropsychologists will at least offer compensatory strategies. I'm glad you have the Ritalin. You might want to try taking it regularly to see if it helps more with continuous dosing. Also, I've got a huge thread over at the HER2 board with more information if you get time to look. Thanks for describing so well the chemo addled brain, Ann! Oh, the frustrations! I was way cooler when my brain worked better. I remember when I first dared think beyond to a "next Christmas". That is indeed a gift ... the ability to plan into a future beyond 6 months. I hope you and your family had a WONDERFUL Christmas and I wish you all many more ... brain addled or not. I have learned to make a list in my notes on my Mac that shares to my phone. Otherwise I would be totally screwed. I hope you had a very Merry Christmas!